By Interacting with the tube door, the player can change the appearance of their astronaut. While facing the medical console, press and hold the Interact Button to recharge your Suit's Energy and restore any missing health. 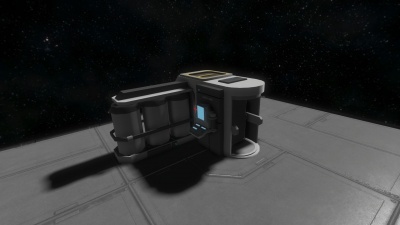 Additionally, if it is connected to the Oxygen and/or Hydrogen supply via conveyor port, it will refill your suit's oxygen tank and jetpack fuel. It lastly serves as a spawn point in the case that the player dies. All of these require the player to either have ownership of the Medical Room, or at least shared access. It is recommended to have more than one respawn point available, just in case. On death a player can select any valid Medical Room as respawn point, if at least one is available. If a player is unable to respawn at a Medical Room, the player either needs to wait for one to become available (usually only in multiplayer), or respawn as a new player in any of the available respawn ships. Respawning in a ship will however erase all previous Ownership, and the player will be treated as if he had never been in that particular world, which can be quite devastating, especially since your own turrets now fire at you. The Medical Room must not be damaged beyond the functional limit. The Medical Room must be powered (a Medical Room uses a constant 2 KW). The player must have ownership or shared access. Note that a Medical Room set to "Share with all" will allow any player to respawn at that room, friends and foes alike. It's faster to recharge your energy, HP, hydrogen, and oxygen at the med bay than inside the Cryo Chamber, although in the Cryo Chamber you do not have to hold down a button (but you do not regain health in cryo). On a rare occasion in a room that is only one block tall; respawning can sometimes kill you instantly as you spawn in the ceiling. This is rare, but it has happened. It is far more prone to happen if the ship is moving, and the players aren't the host. This page was last modified on 21 December 2018, at 02:55.